The Marble Honour Roll commemorates those from the church who served in World War One. 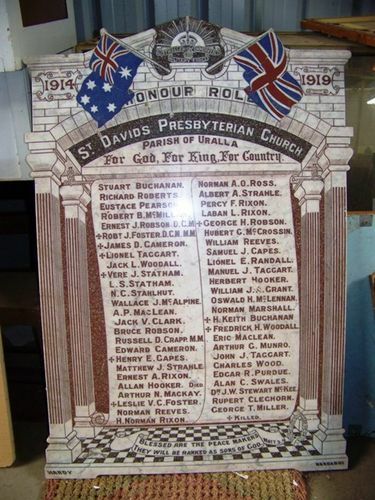 St David's Presbyterian Church, Uralla, has now followed these definitely expresses feelings in installing a beautiful marble tablet upon which is engraved the names, and a large panel containing the photographs, of its fifty-one members who heard the call and fought the good fight. The service of unveiling and dedicating these appropriate emblems of a faith enriched by blood and bravery was held on Sunday last, the officiating minister being Captain-Chaplain R. Scott-West of Burwood. The ceremony, which was rendered the more impressive by the singing of special hymns and psalms, was conducted in the presence of a very large congregation. Note: The roll was photographed at the former Uralla Military Museum which is now closed. Memorabilia from the museum was auctioned in 2013. The whereabouts of the roll is unknown.